Forbes has released its list of top grossing actors of 2016, and Henry comes in at #7, right behind Ben Affleck and Amy Adams! 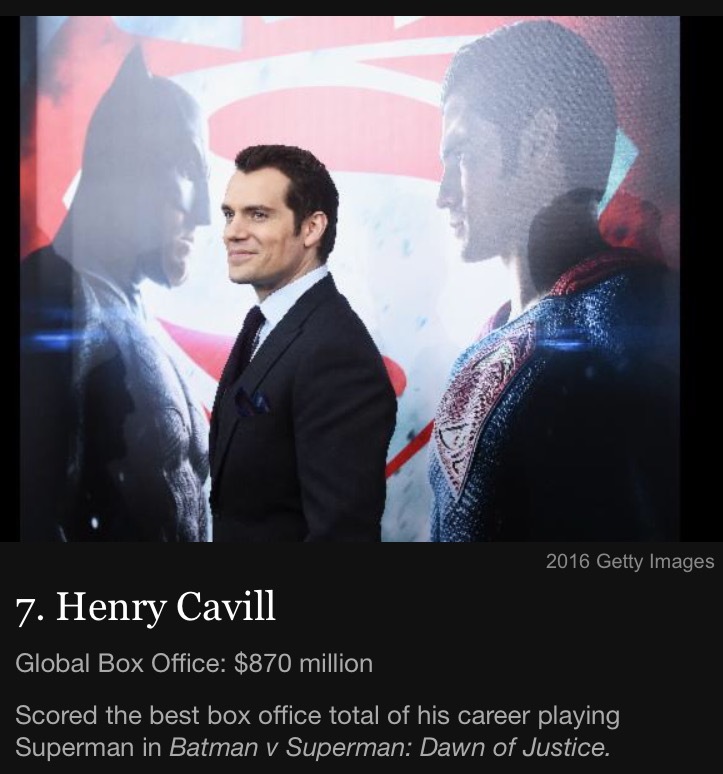 "To calculate the ranking of top-grossing actors, we added up the 2016 global ticket sales of top actors’ films released this year, using data from Box Office Mojo as of December 27, 2016. We did not count animated movies where only actors' voices were used and only included actors who were top-billed and/or had the most screen time." See who else made the list over at Forbes. Justice League will mark the return of Superman, and Henry will also reprise his superhero role in a second standalone film. The excitement is already building for both. And we don't even know what else he's planning.. here's to a productive 2017. Congrats Henry!!! you deserve it! all the best in all you do this year and in the years to come! bring on 2017!!! can't wait for the JL and the MOS2! Well said. Nicole happy new year..
they mean box office gross, its not what he got paid. Oh I see what you are asking, gross is referring to the gross (Total) income of the box office, in other words, it's saying how much money total came in from ticket sales of the movie. Hope that helps. People keep saying 2016 is the worst year for them, but for others it's actually pretty good, HC is a good example. Personally, I loved Batman V Superman, Zack did an amazing job and I'm into that whole impact that came with the each wonderful scene between supes and bats.